Getting to Windsor Castle from London is easy. There's a good bus service to Windsor that is probably the best option since the same service also connects the castle with Legoland Windsor. Regular trains from central London mean you've got a choice of transportation options and good connections to other destinations in the Southeast. Use these information resources to consider how you'll go and to plan your trip.And don't just plan on visiting the castle. There's a new ride in 2019, Haunted House Monster Party at Legoland Windsor that looks like a sure bet for school vacation trips. And, if you are still all caught up in the magic of Prince Harry and Meghan Markle's wedding, A visit now will give you a better chance of exploring the venue - St George's Chapel, Windsor - than if you actually were there on the day. Greenline Service No. 702 is probably the most comfortable way to get to Windsor for the Castle and for Legoland, especially if you have kids in tow. Frequent buses leave from Victoria Colonnades, near London Victoria Coach Station roughly every half hour during the day, seven days a week. The journey takes about an hour. In 2019, round-trip adult tickets cost £19 before noon and £10 after noon. Single and day-return (one day round trip) tickets are available for cash from the bus driver and can also be purchased through an app (see below). Discounts are available for children younger than 15 and children under 5, accompanied by an adult, are admitted free. The bus companies that run this service have been playing annual musical chairs in recent years and their online information has not always kept up. But this popular service has been running for 80 years so you can pretty much count on it being there when you want to travel. The main thing you need to know is that as of this writing - in October 2018, Reading Buses operate the service and maintain a separate website for this route. The bus company also publishes a clear and useful, downloadable Green Line 702 leaflet that has full schedule details, all prices and maps. There's a new Green Line 702 app available from Google Play or The App Store. Use it to keep up with schedules and delays and to pay for your ticket online. The route also accepts contactless payments from UK and European credit and debit cards that offer the facility. If you are able to use the app, there's a generous discount on tickets. UK Travel Tip: The Legoland connection - There's probably too much to see and do at both Windsor Castle and Legoland Windsor to combine the two attractions in one day trip. But if you are staying at the family-friendly Legoland Resort the same Number 702 bus service will ferry you between the main entrance of Legoland Windsor and Windsor castle. Check with Reading Buses, on +44 (0)118 959 4000 for schedules and the fare. You can buy your tickets from the driver. Southwestern Railway operates a direct service to Windsor & Eton Riverside Station from London Waterloo Station every half hour from 5:58 a.m. throughout the day (hourly on Sundays). The journey takes just under an hour and round trip winter fares start at £12.40 (in 2018). Either station is a less than 10 minute walk from Windsor Castle so your travel choice would probably depend on whether you are closer to Paddington or Waterloo at the start of your trip. UK Traveler Tips: For almost all British rail journeys starting at London, there is a price advantage for purchasing two one-way tickets well in advance of the trip. This destination is an exception. There is no advance purchase price advantage and off-peak round trip tickets from London are cheaper than two one-way tickets. Off-peak prices for this destination begin at about 9:30am. Train and coach companies traveling to Windsor Castle sometimes offer special deals that may include entrance to the castle or other offers. It's definitely worth checking with them before you go. 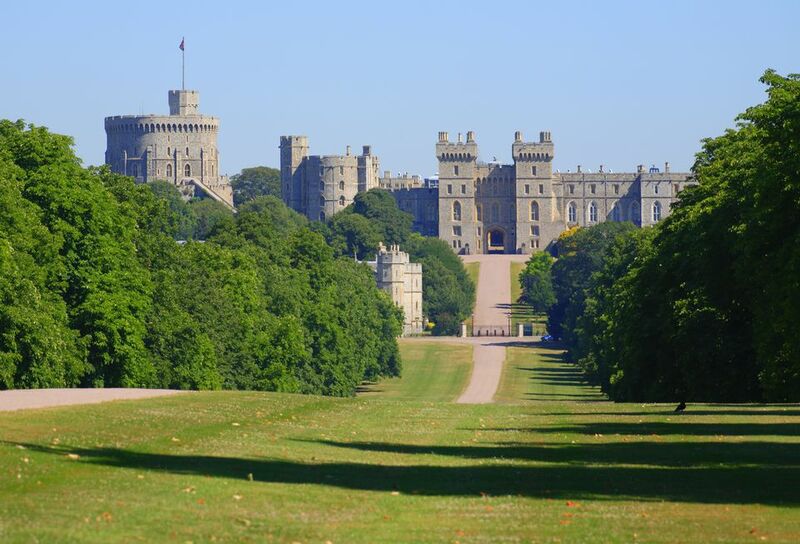 Windsor is 25 miles west of Central London via the M4 motorway. Leave the M4 at Junction 6 and follow signs into Windsor center. It takes about 45 minutes to drive. Parking throughout Windsor is controlled and relatively expensive. If visiting the Castle, follow signs to the Long Term parking. It may involve a 20 minute walk but it costs about a third of the cost of short term parking in Windsor center. An even better option is to use the Park and Ride services at Legoland Windsor or Windsor Home Park. Check the website for current park and ride fees.